Acquired: Signed as a free agent on Sept. 4, 2015. Contract extended on Jan. 11, 2016. Contract extended on Dec. 13, 2016. Contract extended on Dec. 8, 2017. 2018: In 18 games (18 starts), Whyte converted 36-40 field goals – including 52-yard field goals in week 1 and 11 and 13. He also converted 40-42 extra point attempts. He also had one single. 2017: In six games (six starts), Whyte finished with 15 – 16 in field goals and recorded a career farthest 55-yard field goal in Week 2, which is also tied for longest in the CFL this season. He also added 12 – 14 converts. Whyte had 29 punts for 958 yards, a 41-yard average, and 23 kickoffs for 1367 yards, a 59.4-yard average. Whyte also set the Eskimos record of most consecutive field goals made with 25 in Week 4 against the Ottawa RedBlacks. In the West Semi-Final, Whyte converted 1 – 1 field goals and 3 – 3 extra points. In the West Final, Whyte converted 2 – 4 field goals and 2 – 2 extra points and one single. 2016: In 18 games, Whyte ranked number one in the league in field goal percentage with 93.8% accuracy– the third highest single-season mark in CFL history and well above the league average of 82.7%. He was the sole kicker above 90% last season, making 45-of-48 field goal attempts. Whyte was also the only kicker in the league last season to be perfect from 49 yards and in (43-of-43) and one of just two kickers perfect from inside 40 yards. He added 47-of-53 converts (88.6%) in regular season. In the Eastern Semi-Final against Hamilton, he made three-of-three field goal attempts and two-of-two converts. In the Eastern Final against Ottawa, he made one-of-two field goal attempts and two-of-two converts. For his efforts, Whyte was named the Eskimos Most Outstanding Special Teams Player and Most Outstanding Canadian for 2016. 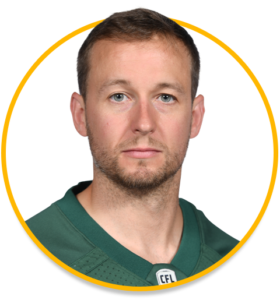 2015: Made his Eskimos debut in Week 11 against Calgary and went on to record 24-of-26 field goal attempts and 14-of-14 converts, while punting 59 times for 2,401 yards with three singles. Whyte made 3-of-3 field goals in the West Final and 4-of-4 converts. In the Grey Cup, Whyte made 1-of-3 field goal attempts, he also made his only convert attempt and had one single. Whyte was voted the Eskimos Most Outstanding Canadian Nominee. (Montreal) Attended training camp with the Alouettes. 2014:(Montreal) Whyte made 41-of-47 field goal attempts and 146 punts for 6,551 yards. He also recorded 12 punt singles and one special teams’ tackles. 2013:(Montreal) Whyte made 41-of-50 field goal attempts and 127 punts for 5,312 yards. He also recorded seven punt singles. He was named an East All-Star for his efforts. 2012: (Montreal) Whyte made 33-of-41 field goal attempts and had 120 punts 5,260 yards. He also had seven punt singles and two special teams tackles. 2011: (Montreal) Whyte made 45-of-52 field goal attempts. He set an Alouettes record for consecutive field goals made with 24, breaking the previous record of 21 set by Don Stewart in 1976. He also had 115 punts for 4,746 yards and seven punt singles, adding one special teams tackle. Whyte was awarded the CFL’s Lew Hayman Trophy for the East Division’s Most Outstanding Canadian. He was also named the Alouettes nominee for Most Outstanding Special Teams Player. 2010:(BC) Made 6-of-6 field goal attempts, adding 15 punts for 601 yards and three punt singles. 2009: (BC) Made 21-of-29 field goal attempts and 71 punts for 2,947 yards. He also had two punt singles and one special teams tackle.